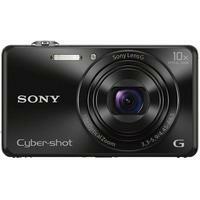 The Sony Cyber-Shot WX220 in black is a portable and easy-to-use digital compact camera with 10x optical zoom, advanced image quality and Wi-Fi with NFC connectivity. The back-illuminated Exmor CMOS sensor delivers 18.2 effective megapixel resolution and low noise, while the BIONZ X image processor provides 3x faster processing than the previous engine and more detailed reproduction of high-quality images. Built-in Wi-Fi with NFC connectivity means images and movies can be shared seamlessly with mobile devices and the camera can also be remotely controlled from a smartphone. Additional features include Full HD movie recording, 4K Still Image Output via HDMI, Picture Effect, and 360 Intelligent Sweep Panorama.